A Michigan teacher has been placed on leave and is under investigation for allegedly assaulting a middle school student who refused to stand for the Pledge of Allegiance. 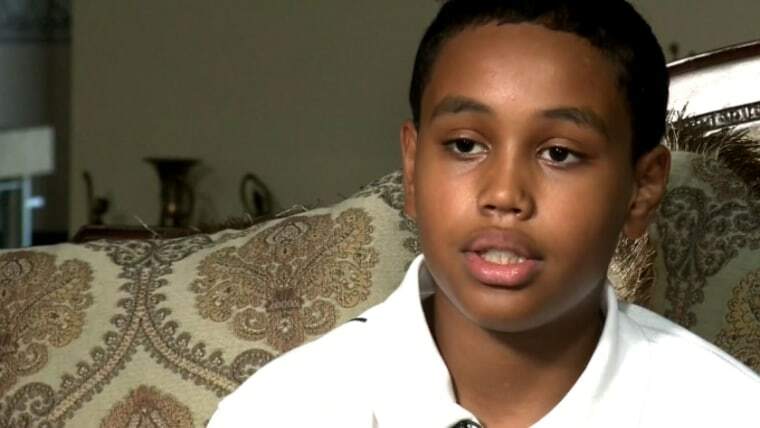 Sixth-grader Stone Chaney had just started his first week at East Middle School in Farmington Hills, Michigan, when he said a homeroom teacher tried to force him to stand for the Pledge of Allegiance. Chaney told NBC-affiliate WDIV in Detroit that he was scared and felt like his rights had been violated. "The teacher consultant comes up behind me and snatches me out of my chair violently," he added, using his father to demonstrate the alleged assault. "I was so confused, I didn't know what was going on." The incident took place on Sept. 7, and Chaney said the next day, another teacher also yelled at him for refusing to stand for the pledge, according to WDIV. "I don't stand for the pledge because I don't pledge to a flag. I pledge to God and my family," he said. "I don't feel safe going to that school anymore, because I don't know what they're going to do to me next." Farmington Public Schools said in a statement shared with WDIV that the district supports the right of each student to decide whether to participate in the pledge. "The teacher allegedly involved in the incident has been placed on administrative leave," the district said. "At this time, the District cannot speculate about the outcome of the pending investigation." Chaney has not returned to school and his family was exploring whether to withdraw him from the school district, his father, Brian, said. He added that while he understood that veterans and others might disagree with his son's decision to protest the flag, it is ultimately his right to do so. "If they're fighting for freedom, they're fighting for us to have choices," Brian Chaney said. "Then it's our choice." In recent years, patriotic protests have become a flash point in American culture. NFL quarterback Colin Kaepernick began protesting the national anthem before games last year after a series of high-profile police shootings of African-American men. Kaepernick's protest sparked conversations on patriotism and free speech. Some also believe it to be one reason NFL teams have been reluctant to sign Kaepernick, who remains a free agent.